1) This paper has been prepared for presentation at the 7th FIG Regional Conference in Hanoi, Vietnam, 19-22 October 2009 and offers an interesting view to one of the key themes of the conference. Spatial planning in coastal regions has emerged as a major issue in the 21st century due to the potential impacts of the changing climate and the associated rising sea levels in coastal regions. This paper explores the potential impacts of climate change and the vulnerability of the coast of Vietnam based upon geodetic information and the present coastal development. It then discusses how sustainable spatial planning approaches could be used to reduce vulnerability to climate change and ensure sustainable coastal adaptation of Vietnam’s coastal zone. 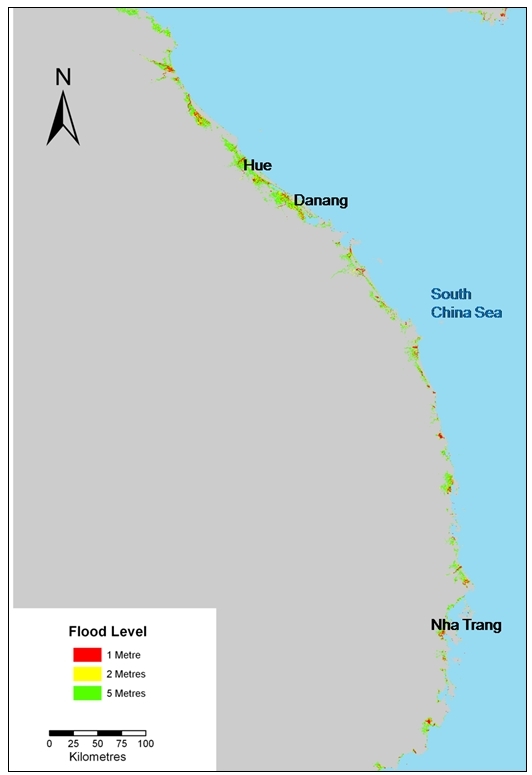 Based on a large-scale flood risk assessment, the study identified that non-structural approach could be used by Vietnam to adapt her low-lying coastline in the North and the South to climate change as this strategy enables vulnerable areas to be occupied for longer before eventual retreat. However, structural adaption policies could be pursued at the central coast which has high elevation and relatively hard geology. The paper revealed that sustainable and successful adaptation to climate change could be achieved if it is perceived as a process similar to spatial planning. It should be planed, implemented well in advance, monitored and evaluated before the occurrence of a natural disaster or an environmental change. Based on this, it recommended that Vietnam should develop and implement coastal adaptation policies now in order to forestalled huge impacts of future climate related disasters. The paper concludes that though coastal adaptation to climate change is a new phenomenon, it does apply key principles of spatial planning concepts and therefore recommended that spatial planning principles should be adopted for the development and implementation of sustainable coastal adaption policies to reduce the impacts of climate change. 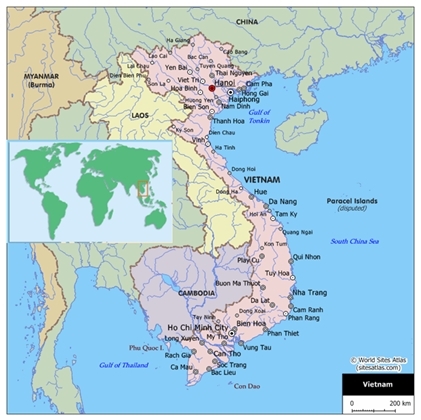 Vietnam is located between longitude 102º 09′ and 109º 30′ East, and latitude 8º 10′ and 23º 24′ North. The country is bordered to the North by China, to the West by Laos and to the South west by Cambodia. The Eastern side of Vietnam is bordered by 3,260km meandering coastline which stretches from Mong Cai in the North to Ha Tien in the South. 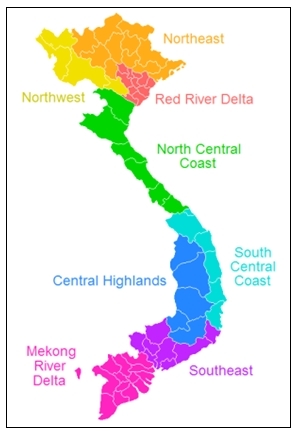 The coastline is dissected by two major river deltas (Red River in the North and Mekong River in the South) and many streams at the central area (Figure 1). The country is divided into 8 administrative regions and 64 provinces (Figure 2). The coast of Vietnam can be divided into 3 cardinal areas: North coast, Central coast and the South coast. The coastal zone comprises 28 provinces out of the 64 provinces in the entire country and it is a home to nearly 50% of the national population (Figure 7) (Hanh and Furukawa, 2007). The country is influenced by two (South-westerly and North-easterly) tropical monsoon climatic regimes and mostly affected by natural disasters associated with these two climatic regimes which include storm surges, monsoon rains, flooding, typhoon and El-Nino conditions. Vietnam has suffered numerous cyclones/typhoons, storm surges and floods, with significant human, economic, and social damage to the country (Imamura and To, 1997). In spite of the diverse measures including construction of coastal dikes, improved river channels, forecasting and early warning systems to control floods, Vietnam still continues to experience significant damage from floods and typhoons. Hanh and Furukawa (2007); Imamura and To (1997) identified rapid population growth, increasing preoccupation around hazardous areas and insufficient financial support to construct and maintain the dikes and river channels as some of the causes of the coastal problem. However, the vulnerability of the coastal zone of Vietnam could be attributed to low coastal elevation, climate change and associated sea level rise. Much of Vietnam’s coastline, especially areas around the two deltas in the north and south and the numerous inlets along the central coast has elevation below 1m. Unfortunately these low-lying coastal areas are largely developed and serve as economic centres of the country. These physical characteristics and the land-use of the coastline make large areas of the coastline more vulnerable to climate change and associated sea level rise. Tuong (2001) identified a sea level rise between 1.75 and 2.56 mm/year at 4 Vietnamese stations (Hon Dau, Da Nang, Qui Nhon, Vung Tau). The high value is observed in the northern and in the southern parts of the country. Another study conducted by Hanh and Furukawa (2007) identified a similar trend and came to a conclusion that there is enough evidence to support the fact that sea level rise is occurring in Vietnam. They observed that the rate of sea level rise in Vietnam is comparable with the sea level rise in the region and in the world. Now two questions that need to be answered are what impacts will the rising sea level have on the coastal zone of Vietnam? And what adaptation strategies should be developed to manage the potential deleterious effects of climate change and associated sea level rise? The aim of this paper is to provide answers to these questions. In order to do effective and reliable assessments of climate change impacts on the coastal zone of Vietnam and to recommend practical adaptation policies, relevant literature on climate change impact assessment and adaptation was reviewed. It was identified from the literature review that many scientific methodologies that have been developed by researchers for the assessment and management of the impacts of climate change are covered in Intergovernmental Panel on Climate Change (IPCC) periodic global assessment report on the impacts of climate change on the sustainability of the world environment and global economy ( IPCC, 2001and 2007). Apart from those methodologies covered in IPCC reports, there are numerous climate change assessment approaches and management policies that have been developed by national environmental agencies and local researchers. 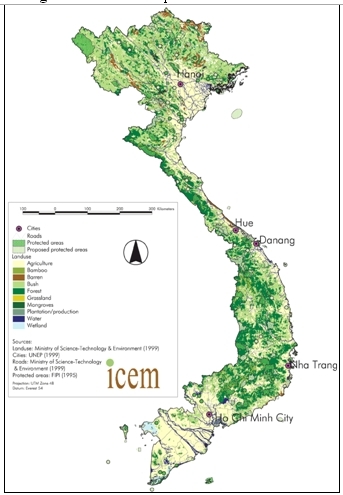 Example of these national and local approaches includes UK’s, Department for Environment Food and Rural Affairs (DEFRA) (2009) climate change adaptation report; International Centre for Environmental Management (ICEM) (2003) assessment report on Vietnam’s protected areas and development; Australian Department of the Environment and Heritage, 2006 assessment of vulnerability of the Australia’s coastal zone and Stern (2006) review on the economics of climate change. Table 1 below provides a summary of key climate change adaptation policies identified in the literature review. Five metres (worst case scenario involving catastrophic melting of west Antarctic ice sheet; Vaughan, 2008). 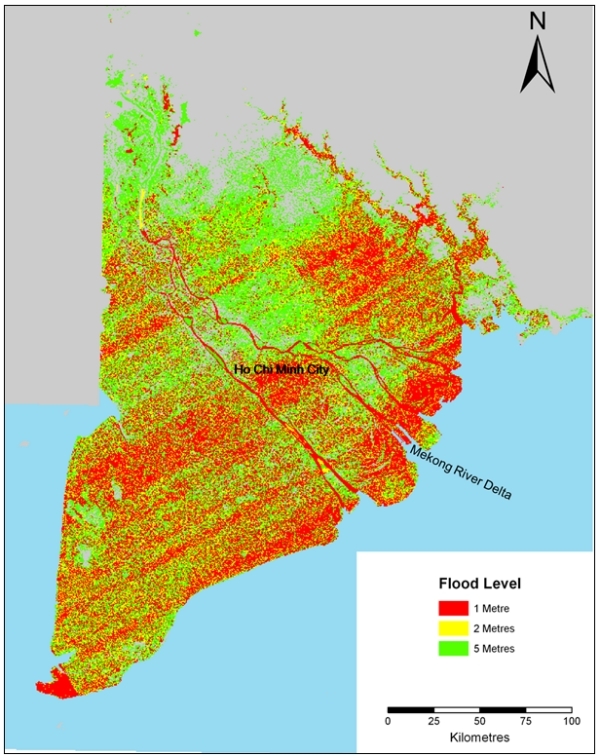 The results of this assessment are presented as the flood risk maps of Vietnam in Figures 3-6. This was followed by analysis and discussion of vulnerability and potential impacts of sea level rise on the coastal zone of Vietnam and the assessment of possible adaptation policy options to manage/address the risks identified from the flood risk maps. This approach facilitated the assessment of alternate adaptation policies and the selection of the best policy option base upon the local circumstances/vulnerability and environmental sustainability. 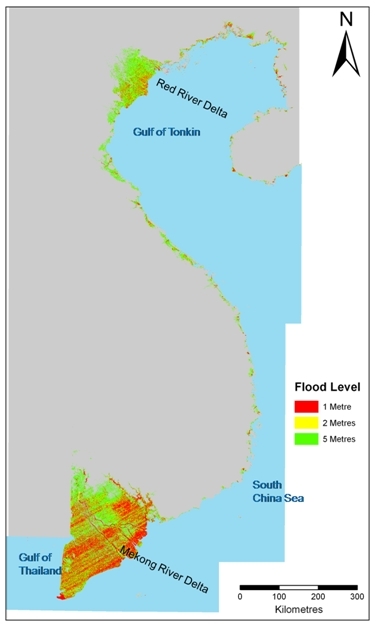 The flood risk assessment result (Figure 3) revealed that a significant proportion of the coastal zone of Vietnam is under severe threat of flooding. 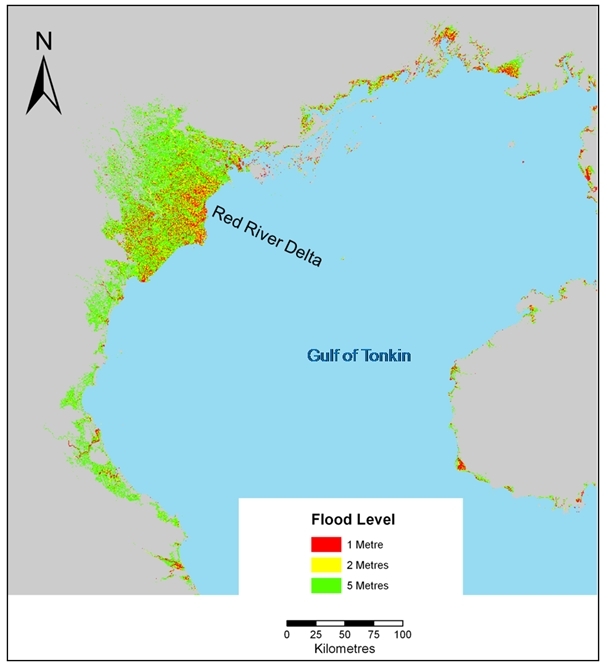 The assessment shows that the Red River delta in the north (Figure 4) and the Mekong River delta in the south (Figure 5) are the highest risk areas. Unfortunately, these two areas are the most fertile, productive and highly developed regions of the country where the capital town, Hanoi and the second town Ho Chi Minh City are located (Figure 7 and 8). It was identified that though the central coastline (Figure 6) has low flood risk, settlements and agricultural activities at the numerous inlets and estuaries are largely vulnerable. It is important to state that the sea level rise assessment in this paper did not consider possible subsidence or uplift (tectonic forces) of the coastline. Holding land movement constant, the flood risk assessment considered the potential impacts of climate induced sea level rise. IPCC, 2007 identified that the severe impact that may be associated with climate induced sea level rise would be influenced not only by the rising waters but also the increased intensity of climatic forces such as increased waves and tidal activities, storm surges, typhoons, increased rainfalls, increase monsoon winds and flash floods. Increased intensity of these climatic forces coupled with the rising sea level could have deleterious impacts along the coast of Vietnam, particularly, the two deltas (Figure 4 and 5). Inundation of the deltas of Red and Mekong Rivers, low-lying coastal areas (Inlets and estuaries) and the intervening fertile agricultural lands. Destruction of coastal settlements in the flood risk areas (Figure 3) will cause displacement many coastal dwellers and possibly result in coastal hinterland migration. If this is not managed properly it could lead to land litigations and ethnic conflict. Increased coastal erosion and landslide especially, around the deltas and the cliffs along the central coast. Increase flooding and natural disaster may lead to increase loss of life and livelihood associated with natural disasters. It may lead to significant loss of farmlands, wetlands, mangrove and cause coastal squeezes. It will cause intrusion of salt water into freshwaters and also increase water borne diseases. It will significantly reduce rice production in the country and reduce food security of the country and other countries that import rice from Vietnam. These impacts, if not properly managed through holistic and reliable climate change adaption policies planned in advance, they could have serious ramifications on the economic development of the country. Vietnam’s economy like many developing countries, is highly supported by agricultural production and heavily dependent on natural resources. Therefore, any natural or artificial phenomena that affect the prevailing natural environmental conditions is likely have serious effects on sustainable economic development and the livelihood of many Vietnamese if not well managed. The huge physical and socio-economic impacts of sea level rise on the coastal zone of Vietnam required serious research effort and policy development towards integrated and sustainable coastal adaptation strategies for the coastline. 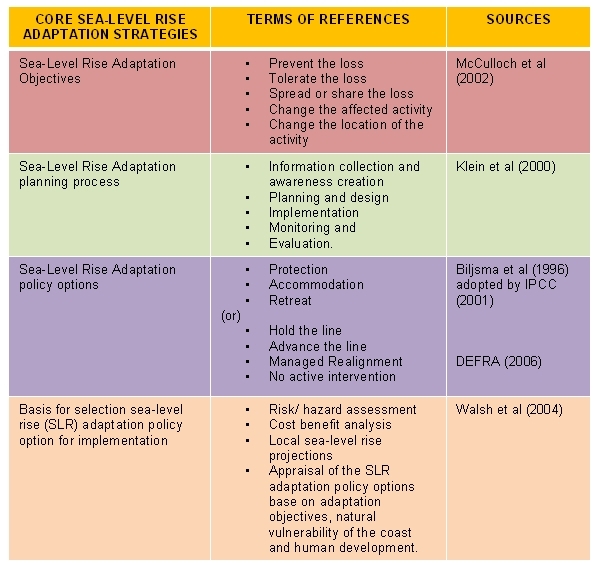 Tol et al, 2008 revealed that to identify the most appropriate coastal adaptation strategy, we must consider the full context in which the impacts of climate change arise and realise that the aforementioned strategies (Table 1) happen within a broader policy process, which includes consideration of numerous climate and non-climate issues. Klein et al (2000) observed that adaptation to climate change in coastal zones should be viewed as a process that comprises more than merely the implementation of technologies to protect against, retreat from, or accommodate sea level rise. Tol et al, 2008 identified from studies in the Netherlands, the United Kingdom, and Japan that coastal adaptation to climate change can be considered as a multistage and iterative process. In each of these countries, management approaches have been adjusted over the past decades to reflect new insights and priorities, including concerns about climate variability and, more recently, climate change. This reflects sea level rise adaptation planning process outlined by Klein, 2000 (Table 1). The concept of multistage and iterative process for coastal adaptation to climate change (Tol et al, 2008) mirrored key principles in spatial planning. By this approach adaptation measures are planned and designed well in advance to reduce the vulnerability of coastal communities or ecosystems to the impacts of climate change. This is done as a process that is conditioned by policy criteria and coastal development objectives and interacts with existing management practices. It also involves monitoring and evaluation of the performance of the implemented adaptation options which may lead to the provision of new information and insights, leading to adjustments in the adaptation process, thus creating a new cycle adaptation policy development. This process is similar to spatial planning processes. There are two approaches in planning theory that explicitly address the substantive purpose of planning. One is descriptive, identifying the purpose of planning with its substantive fields such as land-use planning and development control, environmental planning, development planning, community or neighbourhood planning, and transportation planning (Alexander, 1992). The other is normative, usually with implied ideological associations such as “advocacy planning”, a planning model meant for the poor and designed to promote the interests of disadvantaged communities (Davidoff, 1965). Spatial planning in the 21st century applies these two planning theories in the face of complexities of the integrated human-environmental systems, stakeholder institution, sustainable development polices; international convections and local regulations. Coastal adaptation to climate change could be sustainable and effective if modern planning theories as highlighted above are applied. This is because both spatial planning and climate change adaptation are expected to deal with environmental concerns, involve stakeholders, follow a multistage procedure to develop policy for implementation, apply monitoring and evaluation procedures and above all ensure sustainable development. These complex principles and procedures are well developed and properly understood in spatial planning; hence applying sustainable spatial planning principles to coastal adaptation planning could ensure sustainability and effective adaptation policy development and implementation. Adaptation to environmental change is a fundamental human capability and is not a new concept (Easterling et al, 2004). Throughout the ages, human societies have shown a strong capacity for adapting to different climatic conditions and environmental changes. The resilience and flexibility exhibited in the patterns of human settlements show an inherent desire and some measure of capacity to adapt. This suggests that though the coast of Vietnam is highly vulnerable to climate change, it might have significant natural adaptive capacity. However, our understanding of human adaptive capacity is less developed than our understanding of responses by natural systems, which limits the degree to which we can quantify societal vulnerability in the world’s coastal regions (Nicholls et al, 2007). Easterling et al (2004) however, viewed adaptation as a risk-management strategy: that is neither free of cost nor foolproof, and the worthiness of any specific actions must therefore carefully weigh the expected value of the avoided damages against the real costs of implementing the adaptation strategy. Thus, there is a need for comparative assessment of adaptation policies and strategies so that those likely to be most effective in particular circumstances can be identified for implementation. 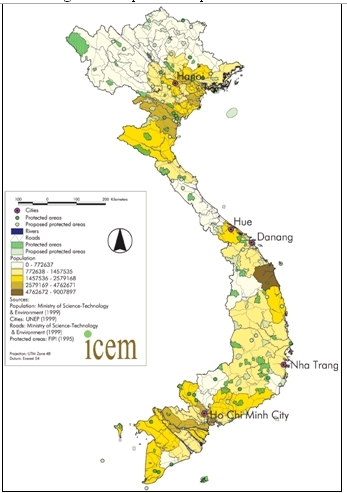 Vietnam could adapt to the impact of climate change through holistic assessment of the physical processes along the coastline, dividing the coastline into risk zones, appraising of numerous coastal adaptation policies and strategies against various risk zones and then selecting the appropriate adaptation strategies risk zones for implementation. This must be done proactively and should be followed by monitoring and evaluation. For instance something should be done in advance to reduce human impacts on both the coastal zone and the catchments area and their effects on the environment and ecosystems of the coastal zone and adjacent areas. Effort is also required on the reduction of the overexploitation of coastal and marine resources such as sand and gravels, heavy minerals, disposal of solid and liquid waste. For instance integrated shoreline management planning approach (DEFRA, 2006 and Boateng, 2009) which is based on littoral cell and sediment budget concept, provides large-scale assessment of risks associated with coastal processes and presents a policy framework to reduce these risks to people, developments, and the natural environment in a sustainable manner could be adopted by Vietnam to manage her shoreline. This shoreline management approach is base on four strategic policy options outlined by DEFRA (2006) in Table 1. In addition, Vietnam could consider some of the non-structural approaches which have been used with some significant success in India, Bangladesh, New Zealand and USA to adapt to the flood risk of their low-lying coastal cities (Mascarenhas, 2004; Nicholls, 2007; Healy and Soomere, 2008 and Boatman, 2008). Examples of some of the non-structural approaches include, coastal buffer zones, building houses on stilt, storm warning system, growing of flood resistance crops and elevated storm shelters with storage of food and medicine. These strategies enable areas to be occupied for longer before eventual retreat. However, for it to be effective, strict land use planning and education should be used to discourage growing trends of human development along existing disaster coastal zone which could exacerbate the vulnerability due to increased risk to life and property. IPCC (2007) identified that one way of increasing adaptive capacity is by introducing the consideration of climate change development planning, by including adaptation measures in land-use planning and infrastructure design and measures to reduce vulnerability in existing disaster zones. The non-structural approach could be applied to the Red River Delta in the North and the Mekong Delta in the South which has low elevation but highly developed. However, structural approach such as dykes, breakwaters, sea defence and groynes could be applied along the central coast due to its high elevation and hard geology. This should be adopted only after detail assessment of the impact of such measures and development of mitigation of their impacts on the adjoining coastlines. It is also worth mentioning that sustainable coastal adaptation may require diversification of Vietnam’s economy from its dependency on natural resources. The paper has revealed that the physical character of the coast of Vietnam and the effects of human development and over-exploitation coastal resources are among the causes increase vulnerability of the coastal zone to climate change and sea level rise. Unfortunately the highly vulnerable area such as the Red River delta and the Mekong River delta are the most prosperous, populous and well developed coastal zones of Vietnam. This makes issues coastal adaptation to climate change a very serious subject that requires the attention of the government, coastal provincial authorities, and coastal dwellers. The study identified many possible impacts of climate change and sea level rise on the coast with significant ramifications on the socio-economic development of Vietnam. It was identified that adaptation to environmental change is a fundamental human capability and is not a new concept hence the coastal zone of Vietnam though highly vulnerable to climate change; it might have a significant adaptive capacity which must be explored, developed and implemented in advance. The revealed that though coastal adaptation to climate change is a new phenomenon, its methodologies apply key principles of spatial planning concepts and therefore recommended that spatial planning principles could be adopted to develop and implement sustainable coastal adaption policies to reduce the impacts of climate change. The study recommended that Vietnam should conduct integrated assessment of her coastline and identify the coast into risk zones. This should followed by an exploration of various adaptations strategies and policies. Then base on environmental sustainability and cost benefit analysis, choice should be made from alternative adaptation policies for implementation at specific sections of the coastline. Based upon the large-scale flood risk assessment conducted (Figure 3-6), it was identified that non-structural approach could be used to adapt the low-lying coastline to climate change. This strategy enables vulnerable areas to be occupied for longer before eventual retreat. However, structural adaption approaches could be used to adapt the central coast which has high elevation and hard geology. The paper reveals that sustainable and successful adaptation to climate change should be perceived as a process similar to spatial planning. It must therefore be planed, implemented well in advance, monitored and evaluated before the occurrence of a natural disaster or an environmental change. Based on this, Vietnam should develop and implement coastal adaptation policies now in order to forestalled huge impacts of future climate related disasters. Alexander, E.R. (1992). Approaches to Planning: Introducing Current Planning Theories, Concepts and Issues Amsterdam: Gordon & Breach. Australian Department of the Environment and Heritage, (2006) vulnerability to climate change of Australia’s coastal zone: Analysis of Gaps in methods, data and system thresholds. AGODEH. Bijlsma, L., Ehler, C. N., Klein, R. J. T., Kulshrestha, S. M., McLean, R. F., Mimura, N., et al. (1996). Coastal zones and small islands. In R. T. Watson, M. C. Zinyowera & R. H. Moss (Eds. ), Climate change 1995: impacts, adaptations and mitigation of climate change: scientific-technical analyses. (Contribution of Working Group II to the Second Assessment Report of the Intergovernmental Panel on Climate Change) (pp. 289-324). Cambridge: Cambridge University Press. Boateng, I. (2009) Development of Integrated Shoreline Management Planning: A Case Study of Keta, Ghana: Proceedings of the Federation of International Surveyors Working Week 2009- Surveyors Key Role in Accelerated Development, TS 4E, Eilat, Israel, 3-8 May. Boatman, T., Rees, S., Baehr, J., LaDart, J., & Drum, R. (2008). A new role for non-structural shoreline management in developing resilient coastal communities. In Proceedings of the American Society of Civil Engineers Conference: solution to coastal disasters ( pp. 526-537). Hawaii: ASCE . Davidoff, P. (1965). Advocacy and pluralism in planning. Journal of the American Institute of Planners, 31(3), pp. 331–338. Easterling, W., Hurd, B., & Smith, J. (2004). Coping with global climate change: the role of adaptation in the United States. Arlington, VA: Pew Center on Global Climate Change. Intergovernmental Panel on Climate Change. (2001). Climate change 2001: impacts, adaptation and vulnerability: contribution of working group II to the third assessment report of the Intergovernmental Panel on Climate Change. Cambridge: Cambridge University Press. Intergovernmental Panel on Climate Change. (2007a). Climate change 2007: impacts, adaptation and vulnerability: contribution of working group II to the fourth assessment report of the IPCC. Cambridge: Cambridge University Press. Klein, R. J. T., Buckley, E. N., Aston, J., Nicholls, R. J., Ragoonaden, S., Capobianco, M., et al. (2000). Coastal adaptation. In B. Metz, O. R. Davidson & J. K. Turkson (Eds. ), Methodological and technological issues in technology transfer: a special report of IPCC Working Group III (pp. 349–372). Cambridge: Cambridge University Press. McCulloch, M. M., Forbes, D. L., & Shaw, R. W. (2002). Coastal impacts of climate change and sea-level rise on Prince Edward Island: synthesis report. Ottowa: Geological Survey of Canada. Pfeffer, W. T., Harper, J. T., & Neel, S. O. (2008). Kinematic constraints on glacier contributions to 21st –century sea-level rise. Journal of Science, 321 (5894), 1340-1343. Tol, R. S. J., Klein, R. J. T. & Nicholls, J. R. (2008). Towards successful adaption to sea-level rise along Europe’s Coasts. Journal of Coastal Research 24(2), 432-442. Vaughan, D. G. (2008). West Antarctic ice sheet collapse – the fall and rise of a paradigm. Journal of Climate Change, 91, 65-79. Walsh, K. J. E., Betts, H., Church, J., Pittock, A. B., McInnes, K. L., Jackett, D. R., et al. (2004). Using sea level rise projections for urban planning in Australia. Journal of Coastal Research, 20(2), 586-598. Dr. Isaac Boateng has been a Senior Lecturer at the School of Environmental Design and Management, University of Portsmouth since 2007. He teaches on the Msc Coastal and Marine Resource Management course. Isaac completed his Doctorial research titled: Sediment Budget Analysis and Integrated Shoreline Management Planning: an application to Ghana’s coast in 2009 at the University of Portsmouth. He hold MSc degree in Coastal and Marine Resource Management from the University of Portsmouth, a Postgraduate Diploma in Scandinavian Welfare Model from Roskilde University, Denmark and also a Bachelor of Education degree in Social Studies from the University of Cape Coast, Ghana. Isaac’s teaching and research experience started in 2001 when he joined the Liberal Studies Department of Kumasi Polytechnic, Ghana as a lecturer.